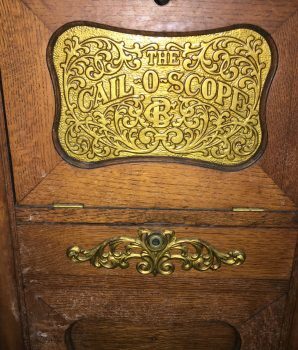 A Cail-O-Scope is a a type of viewing machine invented by the Caille Bros of Detroit at the turn of the century. 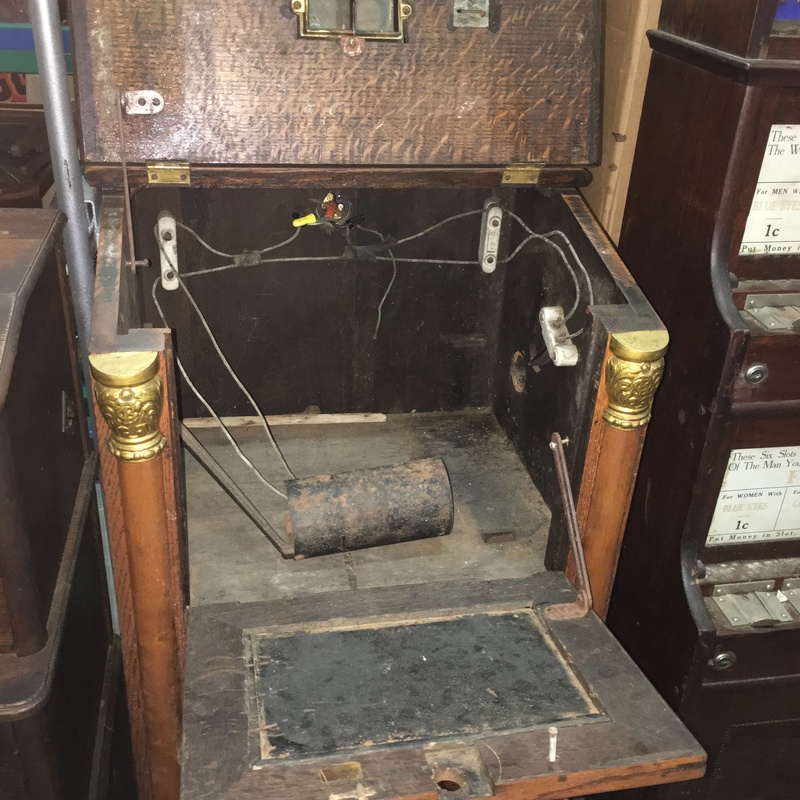 It’s a coin operated device and prized game machine among vintage memorabilia coinop collectors. 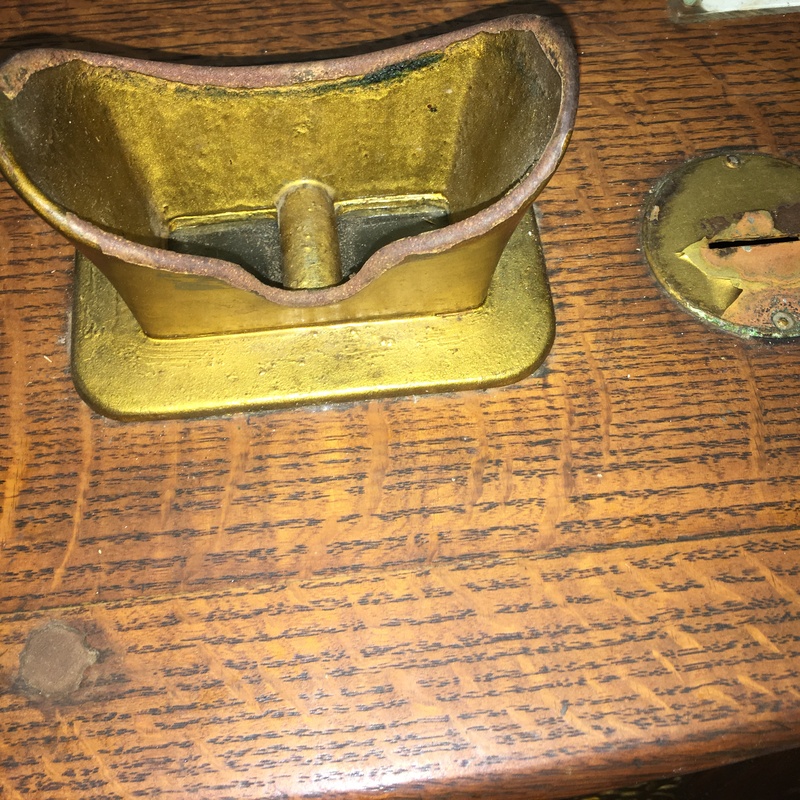 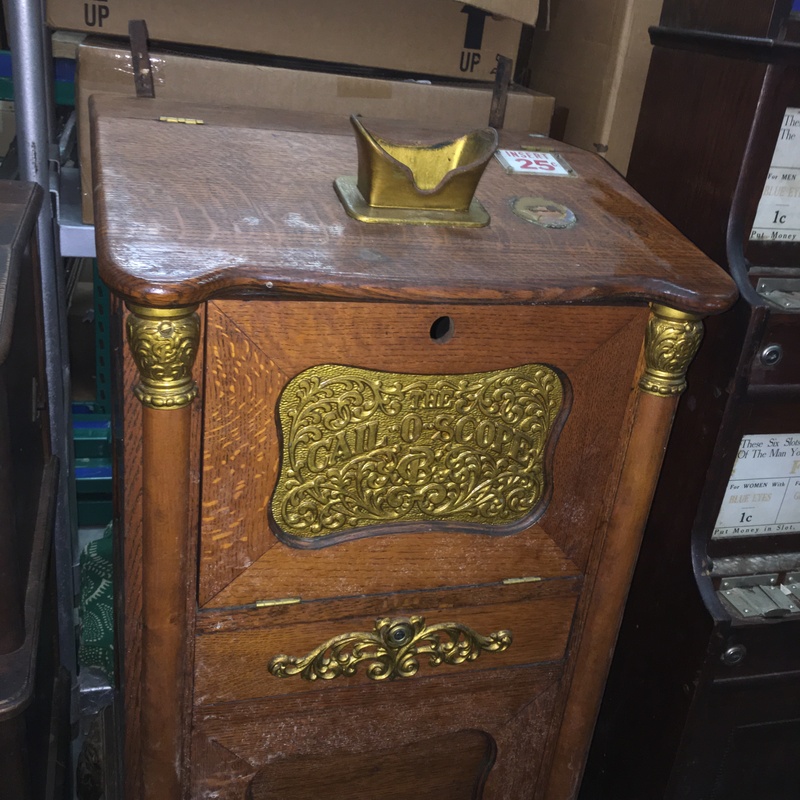 Deposit a coin, rotate the hand crank, and view an animated picture show or peep show by looking through the metal viewers atop the cabinet. 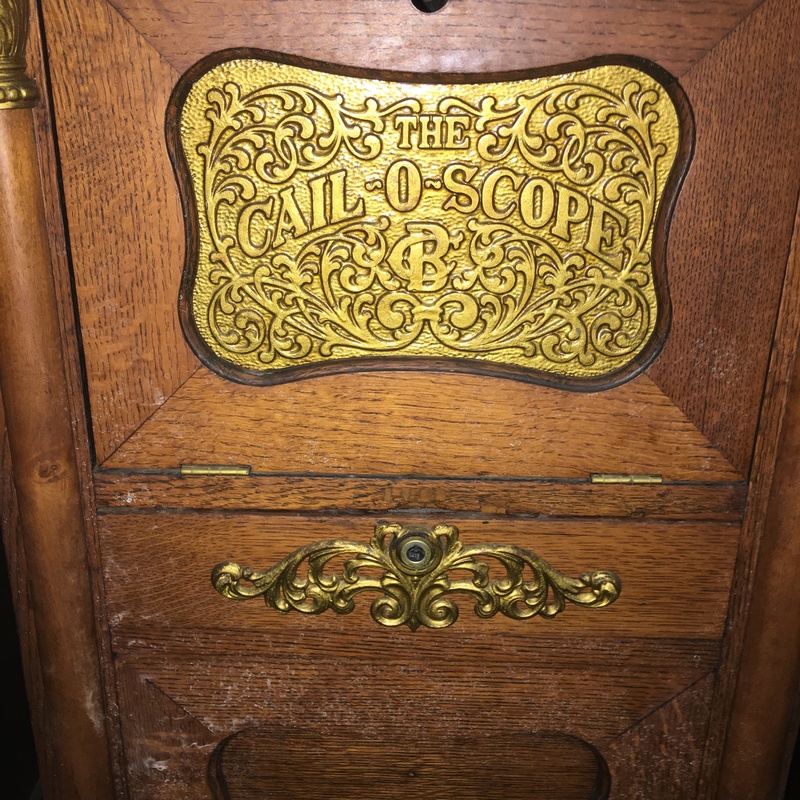 Up for sale is the c. 1904 Caille Bros Cail-O-Scope Case. 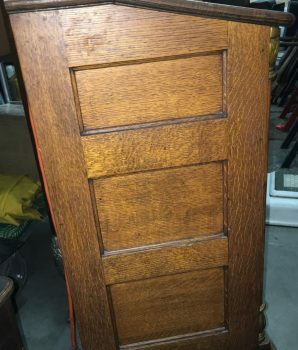 ONLY the Cabinet / Case is for sale. 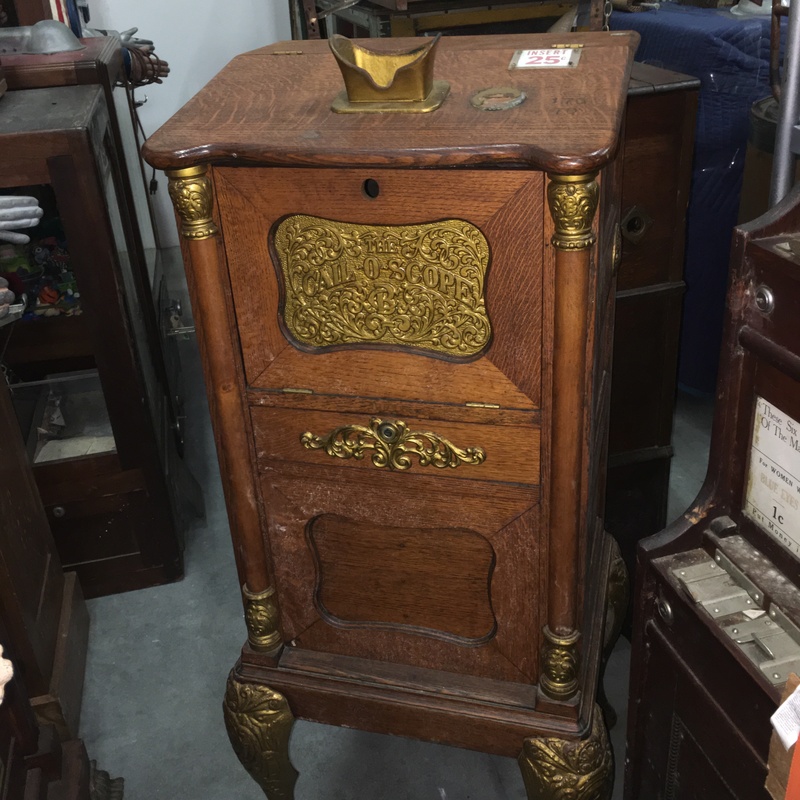 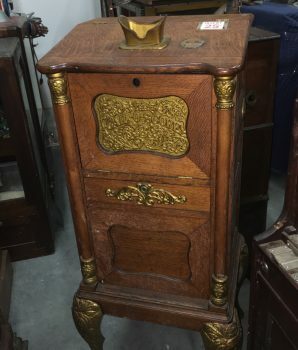 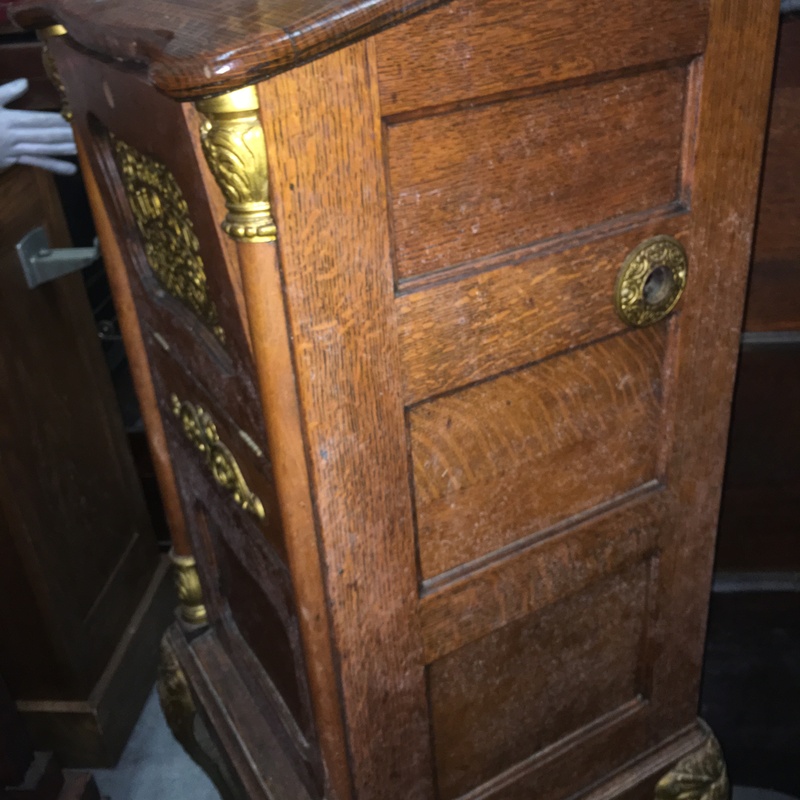 This beautiful Cail O Scope oak viewing cabinet has the original curved cabriole legs, inset wooden panels, genuine cast metal viewer, and the detailed ornamental Caille Bros. Co. embossed emblem on front metal panel. 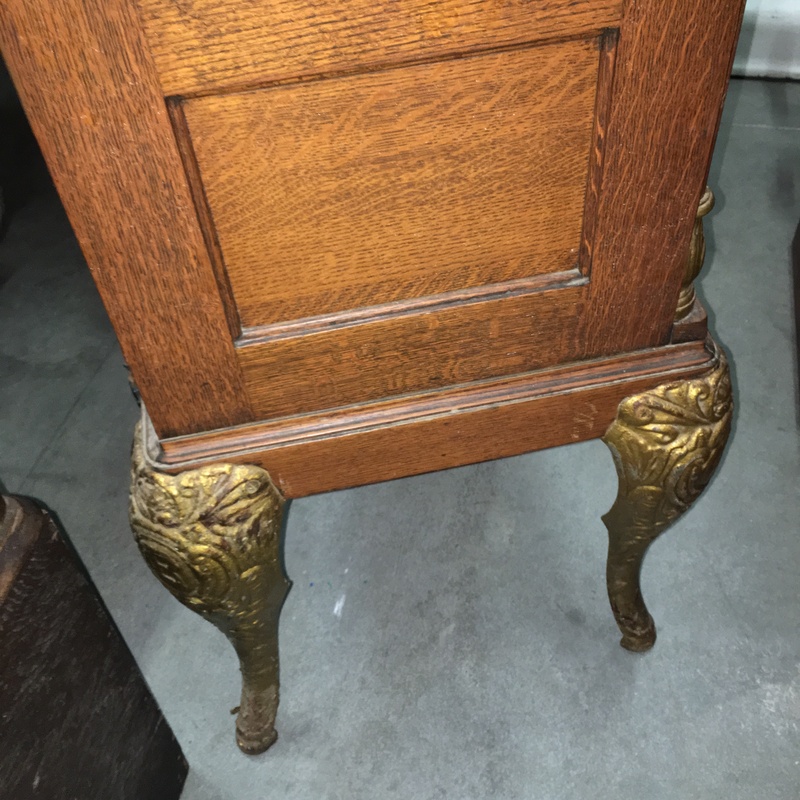 The furniture piece is in very good condition for its early 1900s manufacturing. 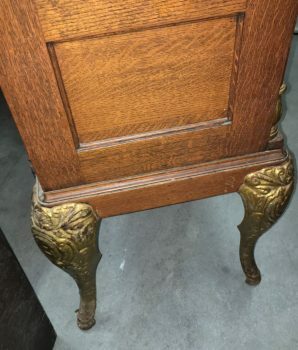 Beautiful shape and case craftmanship. 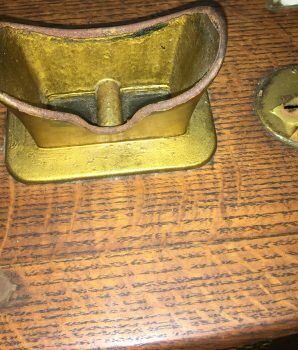 Metal shows minor signs of wear and weathering over the years. 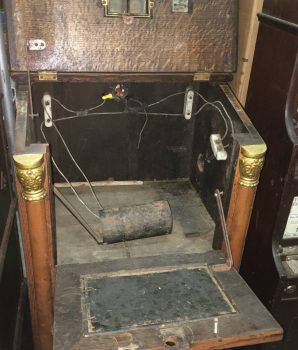 This is an ORIGINAL Cailoscope cabinet. 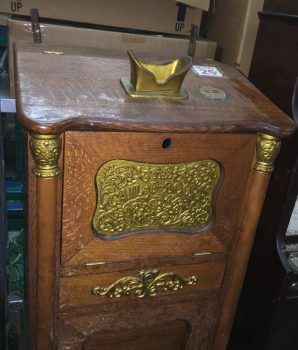 Animated stereoscope picture mechanism is NOT included in this sale. 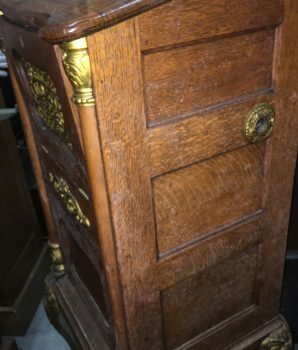 CABINET CASE sold only. 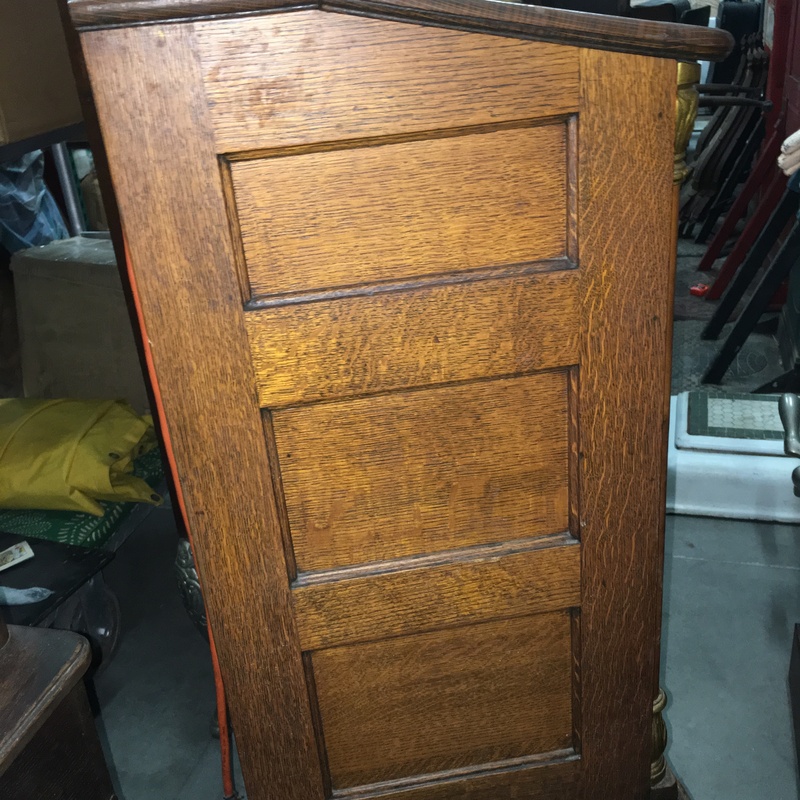 Add this vintage Cail-O-Scope case cabinet to your game room decor.